The word Abyssinia relates to the previous name for the east African country of Ethiopia. There are several theories as to how the Abyssinian cat came to be the breed that it is today. The following information outlines the coat colour and breed variants available. The coat of an Abyssinian cat is ticked. This means that on each shaft of top coat fur there should be two to three bands of colour with a dark tip. This pattern results in a cat with a coat that resembles that of a cougar/puma. 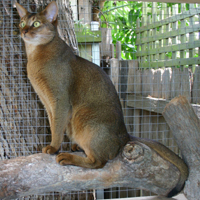 This coat colour is known as tawny in the Abyssinian cat and is due to the dominant black agouti gene. 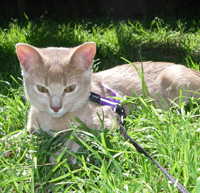 Multiple genes affect the coat colour in cats and in Abyssinians the recessive colours are blue and cinnamon. If both the blue and cinnamon gene pairs are present the resulting cat is fawn in colour. There are also silver Abyssinian cats and chocolate and lilac forms. An inhibitor gene once caused silver coated Abyssinian cats to occur naturally in the population. However, it is thought by many that the gene disappeared from the Abyssinian cat population and the silver coat colours have been re-established with some outcrossing. The chocolate and lilac forms have resulted from outcrossing Abyssinian cats with Oriental cats. The outcrossings occurred in the 1970s and many cat registries do not accept these colours for showing. The Somali cat is a semi-longhaired version of the Abyssinian. It appeared in the 1960s and is thought to have been a natural mutation although some debate this and are convinced a longhaired feline of some sort came into the breeding mix. Somali cats are available in the same range of colours as the Abyssinian cat and are accepted by Australian cat registries for showing. 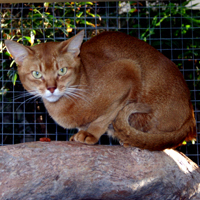 Other breeds such as the Australian Mist (Abyssinian x Burmese x domestic tabby) and Ocicat (Abyssinian x Siamese) have originated from crossbreeding with Abyssinian cats.